The sulcata tortoise commonly known as the African spurred tortoise is a species of tortoise with the genetic name geochelone sulcata. Its taxonomic name sulcata is derived from the physical appearance of its outer shell. 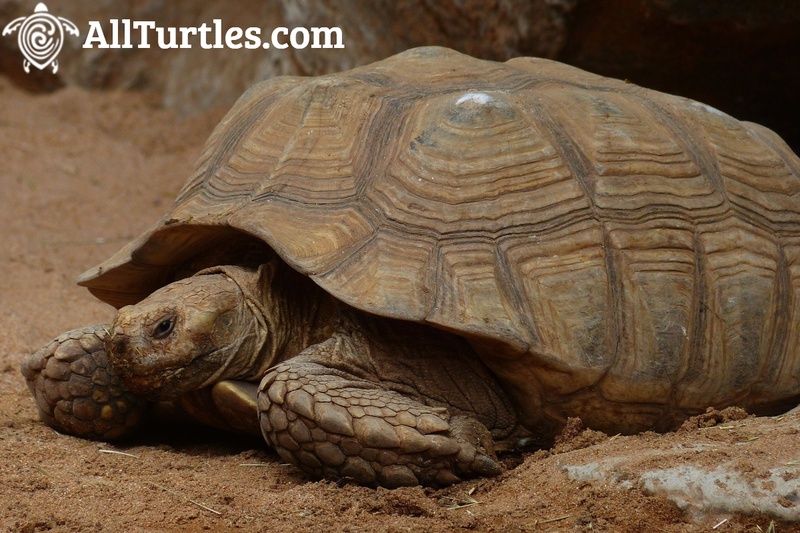 Salcuta means furrow which refers to the deep furrows on the sulcus tortoises’ outer shell. The Sulcata tortoise is found in the southern part of the Sahara desert in North Africa. It is the world’s third largest species of tortoise after Galapagos tortoise and Aldabra giant tortoise. It is however the largest mainland continental tortoise, among those not found in islands. Sulcata tortoise is native to the Sahara desert and the Sahel. The Sahel regions are Burkina Faso, chad, Mali, Nigeria, Senegal, Mauritania, Sudan, Ethiopia and Eritrea. During the hottest parts of the day, Sulcata tortoise is known to burrow 4 meters into the ground in search for cool areas underground with higher moisture levels. It spends most of its day time in these burrows away from the blaring Sahara heat where the mid-day temperatures may reach as high as 45 degree Celsius. The sulcata tortoises are predominantly herbivores. They mostly feed on grasses, shrubs and herbs that have high fiber content but low in proteins. If the tortoises feed in too many proteins, their shell may take a pyramidal appearance. The sulcata tortoise also feed on old bones to supplement it with enough calcium which strengthens its outer shell. They also feed on fruits that are mostly provided when the tortoise has been captivated in a zoo. Breeding mostly take place after the rainy season, from September to November. The male sulcata tortoises become vocal during copulation. The females take a period of around 75 days after mating to lay eggs. The female looks for a suitable nesting site around 60 days after mating. The female forms a nest by digging loose soil out. Once the depression reaches 60cm in diameter and 7- 14 cm in depth, she digs a further depression measuring 20 cm across and deep to the back of the original depression. She takes about 5 hours to dig up the nest depending on the texture of the soil. Once the nest is ready, the female begins to lay eggs at a rate of one egg in every 3 minutes. She can lay about 15- 30 eggs in a span. The female then covers the eggs with loose soil for them to hatch. The incubation takes around 120 days. Mature males develop reverted marginal scales in the front. The skin of the Sulcata tortoise is very thick to prevent fluid loss through transpiration. Sulcata tortoises are extremely efficient in their use of water. they urinate just 0.64 ml a day. Too much water may lead to health problems such as skin / shell infection and kidney problems. Sulcata tortoises are very strong and like to move around. When temperatures exceed 40 degrees, the sulcata tortoise salivate heavily and smear the saliva on their fore arms to help cool them down. It may die of hyperthermia if the fall on their backs during the hottest part of the day. Sulcata tortoise can also choke or drown on its own vomit when they panic. Not many predators are able to feed on the salcata tortoise due to its hard shells. However, animals such opossums and raccoons may prey the sulcata tortoise when asleep. Dogs and cats may also harm these tortoises when trying to be playful. It should be noted that due to their economic value, the sulcata tortoises can easily be poached or hunted by human. IS THE SULCATA TORTOISE ENDANGERED? Unlike other tortoises (like the Madagascar radiated and Galapagos) that are in the endangered species list, the salcatas tortoise is not majorly endangered. The Sulcata tortoise does not hibernate, so is should not be kept outdoor when the temperatures get below 20 degrees Celsius. They also require a large grassy yard with strong fences surrounding it. The Sulcata tortoises are burrowers. These burrows may be filled with water or collapse and cause the tortoise to even die. It is thus important to place something solid at the end of the burrows. For their diets, dark, leafy greens such as mustard, collard and red leaf lettuce are the best. Uses the bathroom often, its excremant holds moisture and actually fertilizes the seeds of the plants it has eaten. Since the turtle uses the bathroom around its burrow, it will essentially have a garden close to home so will have pleanty of food available.